We’re not even half way through 2018 and I am pretty confident I’ve found my favorite novel of the year. 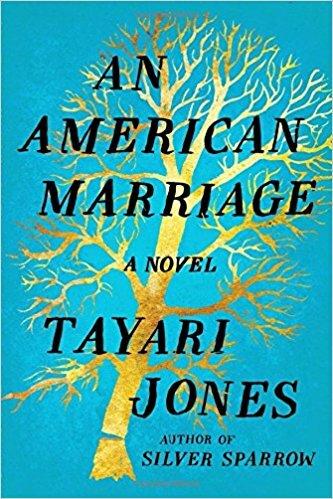 Yesterday I finished An American Marriage by Tayari Jones, which was published on February 6th. I immediately needed to shout from the rooftops (aka social media) about how amazing this book is. I picked it up on Saturday on a trip to the library. In an attempt to spend less time connected to my smartphone, I went searching for a few Playaway audio books. I could tell by the appearance of the case that this was a fairly new addition to the library’s collection. I’d heard of the book and knew it was getting a lot of buzz, but that’s about it. The Oprah’s Book Club logo sealed the deal so I decided to give it a go. 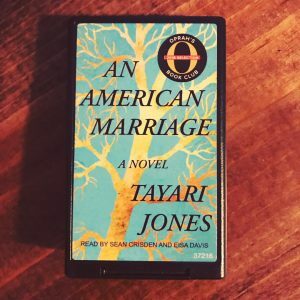 I started listening to An American Marriage on Saturday afternoon and was immediately hooked. 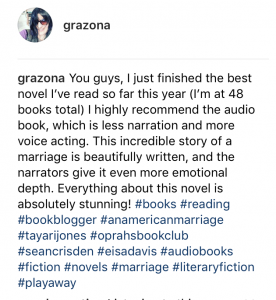 The two narrators, Sean Crisden and Lisa Davis, give the characters an emotional depth I could never have created with my own physical reading. I’d call it more voice acting than narration. Everything about this novel is stunning. The writing is beautiful and poetic, which is fitting for this gut wrenching story of a marriage and the people in its orbit. Celestial and Roy have been married less than two years and are still enjoying their honeymoon phase. When Roy is wrongfully arrested and sentenced to prison for a crime he didn’t commit, their marriage is put to a unimaginable test. If you read the blurb and other reviews, they will give you more details about the story but I don’t want to do that here. What made the story so powerful for me was that I wasn’t familiar with the book and didn’t know what to expect. Often these are my best reading experiences because I have no expectations. What I will tell you is to be prepared to be hit with emotions from all sides: joy, anger, sadness, sorrow, happiness, they’re all here. The characters are amazingly developed. This often feels more like a non-fiction read, especially listening to the anguished voices. And here’s the real reason this story hit me so hard: Even though my circumstances are nothing like Celeste’s and Roy’s, I couldn’t help but think “What if” in regard to my own marriage. 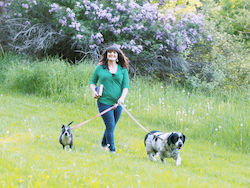 What if I were in Celeste’s position? How committed am I to my husband who I absolutely adore and have all the faith in the world in? This novel reiterated to me the sheer unpredictability of life, how one moment can change our circumstances forever. It’s a fascinating exploration of not only the two people in one marriage, but several individual lives. It showcases how intertwined our lives are with the people around us. It had me contemplating marriage, divorce, life and death, family, friendship, justice and revenge. When I finished the Epilogue, my heart was all stirred up and my head was spinning. I read a lot of good novels over the course of a year, even a bunch of great novels. Rarely do I encounter one that reaches to my very core. I can’t decide if I hope to encounter a novel better than this one yet this year or not! 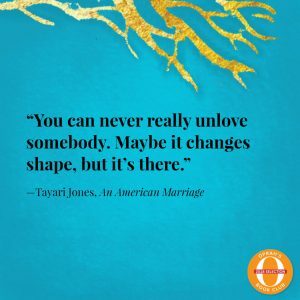 Have you read An American Marriage? If so, I’d love to hear how it affected you so please comment. If not, let me know if you plan to!